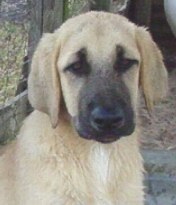 I have found the Anatolian Shepherd to be the ultimate in livestock guard dogs. They are loyal and hard working, not to mention handsome. 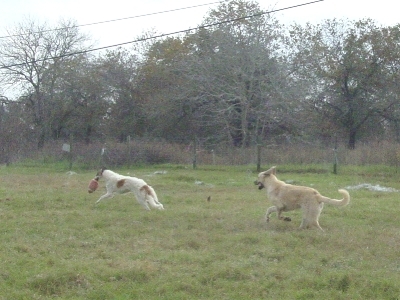 The pups below were acquired by Shefaro from the Crockett Charolais Ranch where they were raised around cattle. 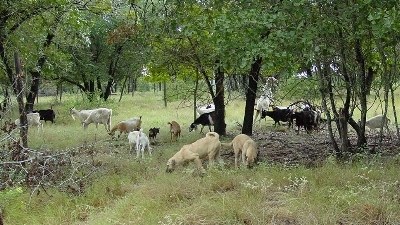 The Pinto Anatolians were raised at Shefaro where live with sheep and goats. 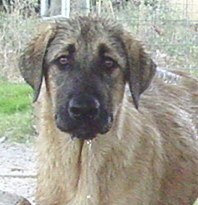 This is Angel, Puppy Girl's dam and one of my favorite Anatolians. 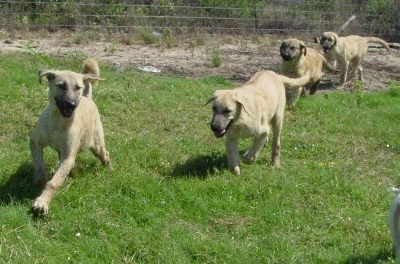 Buck and Tiger are in their new homes. 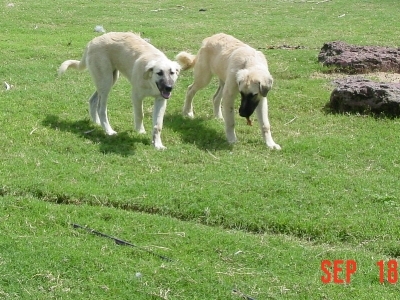 Sandy and Sam - Sam is considered a "white mask" as opposed to the "black mask" and has rarer markings, I am told. His mask is visible over the eyes and muzzle. He's the reverse of his brothers and sisters as to markings, but that's the only difference. 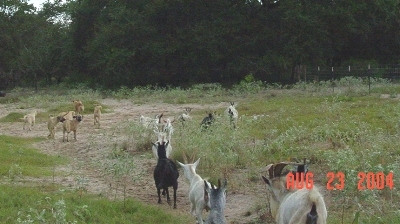 Sam is now a goat guard dog in "The Valley" south Texas. 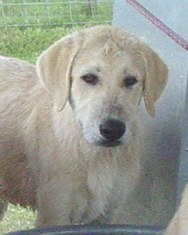 Sandy leaves for her new home in Missouri where she will guard sheep. Maggie leaves for Virginia next month, November 2004. August 18, 2004. 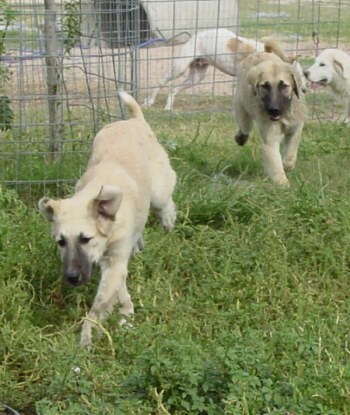 It was the Anatolian Pup's first day here, so they followed the Borzoi pups every place! Enjoying the stock tank after a romp. 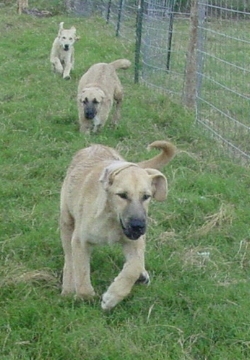 These pups are big, strong, well muscled and have great temperaments. 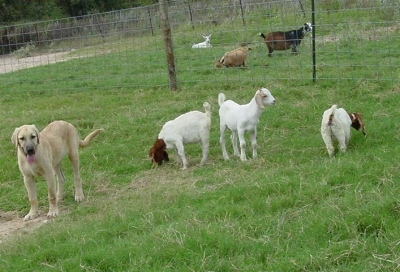 Going with the goats to Shefaro Park. Anatolians come in colors. Here are examples of Pintos. 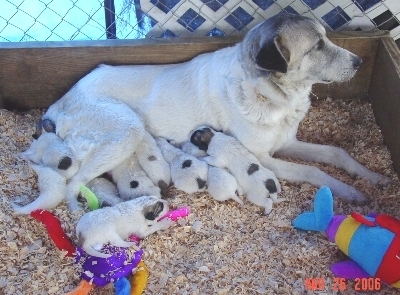 Mama Antolian with her pups. Shefaro Borzoi and Boer Goats has adopted a pair of Cheetahs. Please do your share. Click on the link above. 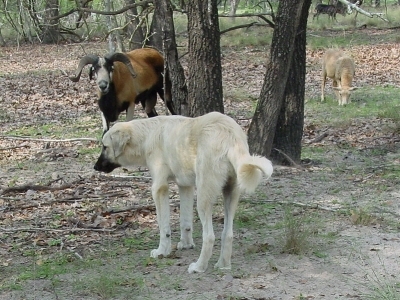 The Cheetah Conservation Fund’s Anatolian Shepherd Livestock Guarding Dog program is a successful, innovative program that has been helping to save the wild cheetah in Namibia since 1994. Working with local farmers and their livestock, this program is one of several non-lethal predator management strategies that CCF has developed. In addition to directly saving the cheetah from indiscriminate removal from the farmlands where they live, this program also fosters goodwill between CCF and the farmers, thus improving the cheetah’s chances for survival. Only about 12,000 cheetahs remain in the wild, of which 20% (about 2500 cheetahs) are in Namibia, the largest remaining population in the world. Over 90% of Namibia’s cheetahs live on commercial livestock farmland, due to pressures from other predators in preserves and protected areas. The removal of lions and leopards from the farmlands, in addition to plentiful natural prey animals and an abundance of water, have opened up a niche for the cheetah and have allowed it to exist on Namibian farms. Inevitably, this sharing of land and resources has led to conflict, with the cheetah on the losing end. In the 1980’s, Namibia was hit hard by drought. The cheetah’s natural prey base died, or was killed by farmers to reduce grazing and watering pressures on their livestock. With little natural prey to hunt, some cheetahs were forced to take livestock. Many farmers consider the cheetah to be a major threat to their livestock. In Namibia, cheetahs are a protected species. 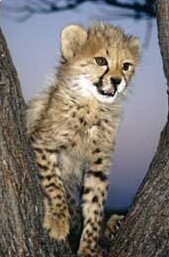 But when cheetahs come into conflict with humans and their livestock, farmers are allowed to "remove" the animal. Trapping and shooting cheetahs that are suspected of being a threat to livestock is permitted. Sometimes cheetahs are just passing through, but are immediately labeled as a "problem animal". CCF’s goal is to help livestock farmers find ways to co-exist with cheetahs. 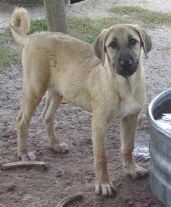 The Anatolian Shepherd originated in the arid Anatolian Plateau region of Turkey and Asia Minor over 6000 years ago. This environment is very similar to Namibia, with very little rain, extreme heat in summer and cold in winter. 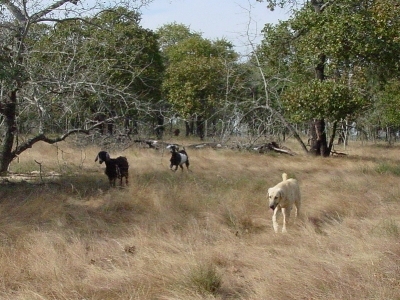 Used for guarding livestock, the dogs were expected to work in a vast open area without the presence of humans. 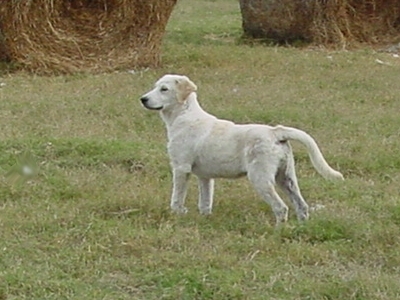 Through selective breeding, the "ideal" Anatolian livestock guarding dog emerged. 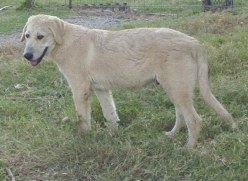 The Anatolians possess a light-colored, medium length coat, often with dark facial shading. This functional coat insulates the dog against sun and extreme temperatures. They have a large and imposing stature, with males standing approximately 24 inches + at the shoulder and weighing 155-165 lbs. They have large heads and chests, with a tapering body. Their excellent eyesight, sharp hearing and strong dedication to their herd make them ideal for the job. 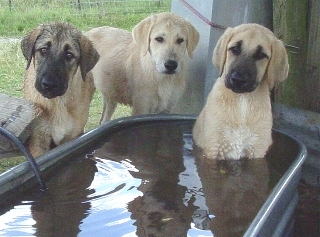 The Anatolian Shepherd is bred to be a working dog, and thus is very attentive to its herd. The goal of CCF’s program is to raise the young Anatolian with the herd, so that it bonds with the livestock, instead of humans, and thus assumes the role of protector. This program is an extension of a livestock management practice already used by Namibian farmers. 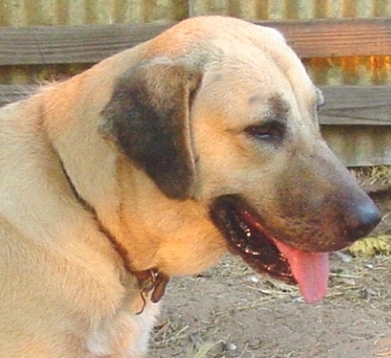 Some farmers have used other breeds of smaller dogs to protect their livestock, so introducing the Anatolian Shepherd was a logical extension of the practices already utilized by Namibian farmers of the region. 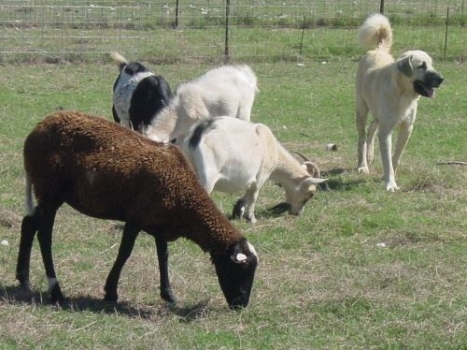 CCF’s livestock guarding dog program involves selective breeding of dogs, careful selection of recipient farmers, training for the new owner to train his/her dog for a successful guarding career, as well as follow-up to make sure the dog is doing well. 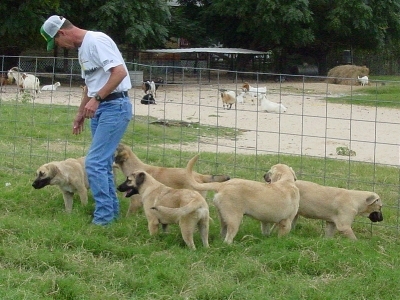 The puppies are weaned from their mother and placed with their new herds at 7 to 8 weeks old. 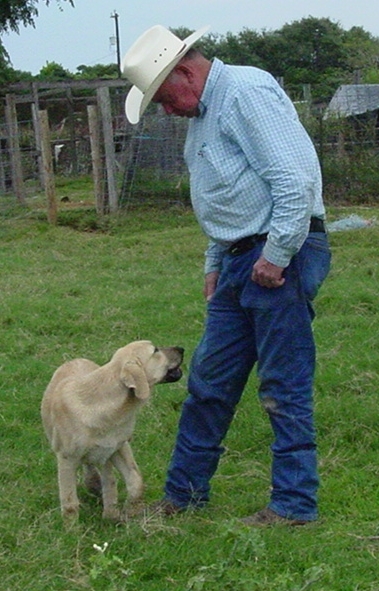 It was found that this is the critical age where the puppy can successfully bond with the livestock. 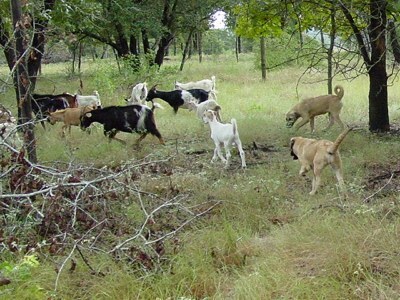 The young dog goes out with the herder and the livestock right away, to habituate it with the behavior of the livestock and wild animals. 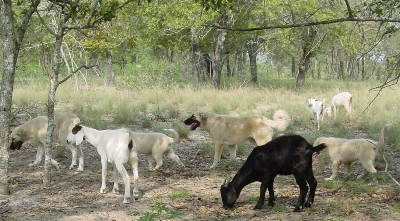 Human interactions are kept to a minimum, to avoid bonding with people, which would decrease the dog’s attentiveness to the herd. However, the puppies must be carefully supervised and introduced slowly to their job and the dangers of the African bush (snakes, predators, tick-borne diseases, getting lost, etc.). 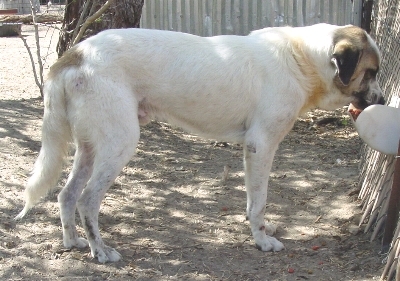 Herders must be careful to check their dog for ticks, illness or injury each day. 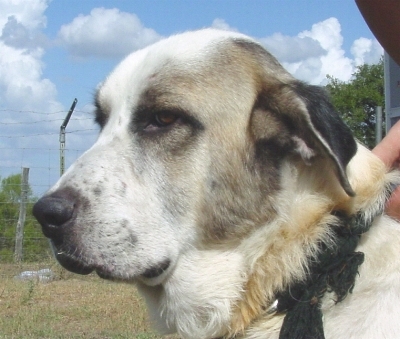 A well-trained, well-cared-for Anatolian Shepherd is an imposing barrier against the predation of its livestock herd. 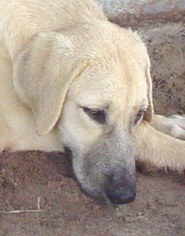 The Anatolian Shepherd lives with the herd, eats and sleeps with the livestock and travels with them. 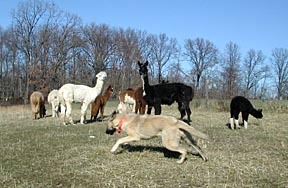 The dog is always on alert, and must defend its herd against a variety of threats. 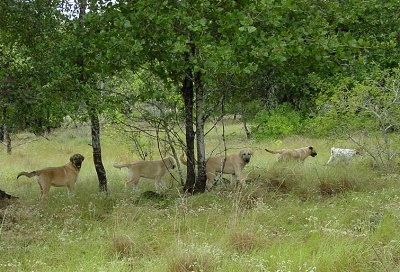 The CCF Anatolian Shepherds have defended their herds against baboons, jackals, caracals, cheetahs, leopards and even humans. The dog is not trained to chase or attack — its job is to bark and posture to scare the predator away. But occasionally the dog is forced to physically defend its herd, and its size and strength make it a formidable obstacle. Cheetahs are not normally aggressive, and are quick to retreat from a barking dog. The barking of the dog is normally enough to scare away a predator, and also alerts any nearby humans to the threat. 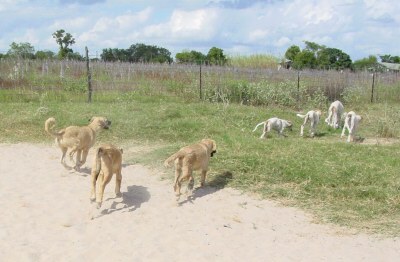 The dogs used in CCF’s livestock guarding dog program are all carefully bred on CCF’s Research and Education Center and demonstration farm in Nambia. 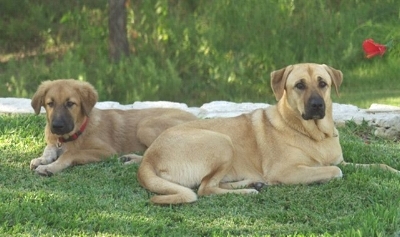 CCF maintains a registry to track the breeding histories of each dog, and to document the placement and work of the dogs. 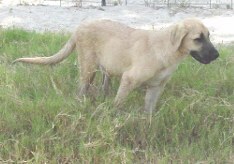 The original 10 Anatolians for the program were imported from the United States to Namibia, a donation from Louise Emmanuel of Birinci Anatolians and the Livestock Guarding Dog Association, through the direction of Dr. Ray Coppinger, Livestock Guarding Dog specialist. 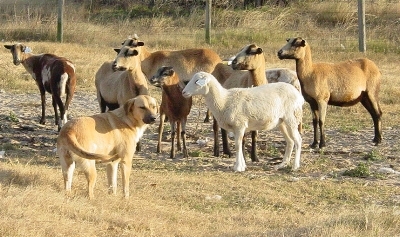 From those first dogs, many litters have been born and successfully placed with livestock herds. 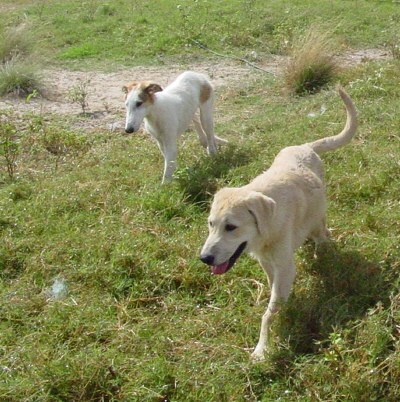 Currently, over 80 CCF dogs are protecting livestock herds on Namibian farms. 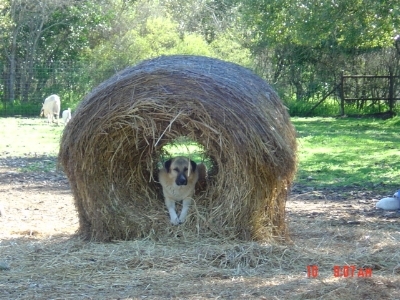 Boots, one of the first dogs in the program, enjoys her retirement now on CCF’s farm. 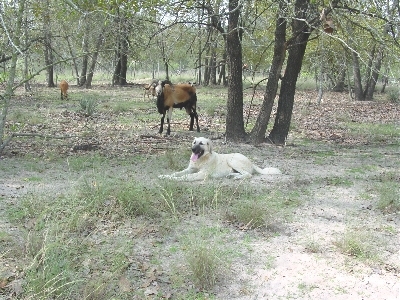 Two other dogs, Caesar and Zanta, are working guarding dogs at CCF’s farm where they protect CCF’s own goat herd. 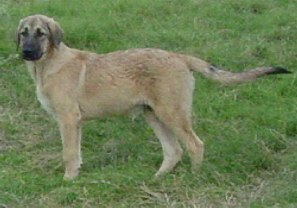 They are also involved in the breeding program. Koya, a female, has been assigned the duty of companion to Chewbakka, CCF’s ambassador cheetah on the farm. As one of CCF’s most intensive activities, the Livestock Guarding Dog program costs over $40,000 per year to breed and care for the dogs, as well as educate the farmers (costs increase yearly as the number of dogs increases). As a CCF supporter, your generous donations help to support this life-saving program for the wild cheetah. 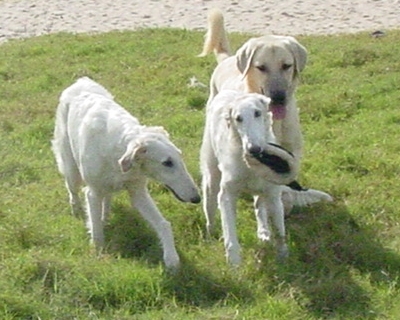 and plays with Borzoi Roberto and Valiente December 2004. 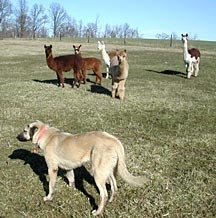 Maggie is a llama guard dog. Here she is with her herd. Anatolians are clever and adaptable. Sam found shade inside a round baleof hay that had the center eaten by his goats. 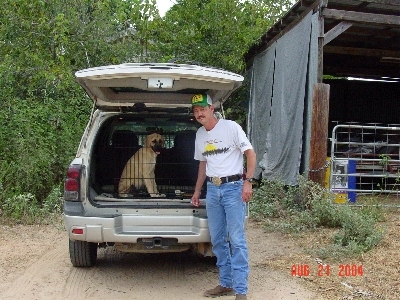 Sam lives with Richard and Linda Smith of San Antonio, Texas. 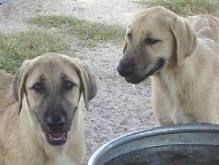 Buddy, left, is a 3/4 Anatolian Shepherd sired by Buddy, out of Uehli, and his friend, a purebred Anatolian, Anabelle at their home. Miracle is a new addition to Shefaro. 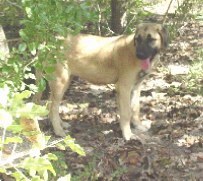 She is 3/4 Anatolian and it is a miracle she's alive. She was born at a ranch where wild hogs and havelina abound. Her mother had the litter in the woods and carried little Miracle to the house all cut up from a hog or havelina attack. Ann nursed her with a bottle and I brought her home at about eight weeks of age. She is just wonderful, a great guard dog and right at home in Shefaro pasture with her herd. She a beautiful and proud girl. Shefaro's new Anatolian Shepherds Rowdy and Rachel born April 25, 2006 enjoying life at Shefaro and learning to guard their goats.